2018 is my year of unconditional love. A great friend of mine came up with the idea of picking a spiritual principle at the beginning of each new year. It’s usually something one needs to incorporate in their life or the antonym of what they’re struggling with. I’ve found it to be a tangible New Year resolution and more formative then a diet or sleep schedule. It’s been a great pleasure to sit around with friends and brainstorm what we need, what we want to create in the next year. Loving someone, or something without conditions, what a concept. It immediately makes me think of the relationship between a mother and child. I love my siblings and my parents without any limits. No matter what, no question. With others, it’s more of a choice. I’ve learned that a considerable amount of love is a choice. I lack practicing unconditional love with friends and strangers. I am prone to making judgements and internally denouncing someone else’s words simply because I don’t agree with them. When I don’t have acceptance for where someone is at emotionally, spiritually, and physically, I’m unable to practice unconditional love. Without it, I become the fair weather friend. I become the condemning spouse. I criticize any shortcomings within myself with the same cruel judgement. I feel like I’m finally able to share some examples of how I’m applying this into my life and interactions with others. Just about all my dealings with others involve hugging (weird, I know). For the longest time, I would do the one armed hug with the ever so polite kiss on each cheek. Now, I’m focusing on embracing. You know that noticeable difference, between a “hello” and an embrace? That’s what I’m going for. It’s a win-win situation. I love my friends. I love most of the people I come in contact with. But, I have this problem. I love to be right. Love it. I love it so much that I’ve developed a habit of correcting people, telling them what they’re doing wrong, and offering a solution. Seems innocent enough, right? Nope. I don’t know what’s best for everyone, I don’t know everything, and most things are none of my business. I’ve learned that most people just want to be heard, and my job is just to love. Last week, I was listening to a friend speak and needless to say I wanted to jump in. I brought the thoughts back “my job is just to love you” I said to her in my head. I was able to continue listening, because I was no longer her shepherd or her teacher or anything; I was just a friend. So, the limits break because I’m no longer holding that person to a standard or allowing a judgement to come between the two of us. Developing unconditional love for myself has been a process to say the least. The relationship with myself is the longest, most intimate relationship I will ever have. I want it to be a respectful, loving one. God, I know how long it takes to change a thought process. Someone suggested affirmations, which seem to work. It’s been like making vows to myself. I love myself no matter what my body looks like. I love myself no matter how much money I make. I love myself for better, or for worse. I love the parts of myself that are changing. I’m excited to feel the changes that come when I focus on spiritual principles, especially this one. I’m hoping to do more, love more, be more conscious about how I’m viewing others and myself. When I’m loving, I feel good, simple as that. It helps bring the focus of myself, which instantly makes me feel better about myself and the world. 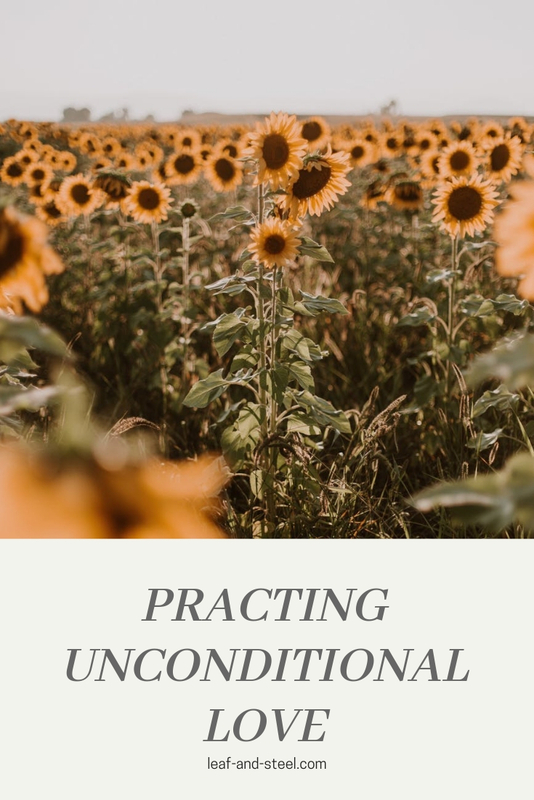 I debated writing this since we are well into 2018, but I decided I wanted some evidence of working this spiritual principle in my life prior rather than pontificating.Do you have any experiences with unconditional love? Have you found a way to cultivate it in your everyday life? Let me know below! Next 30 Snow Day Activities for Adults! Well , I think unconditional love for yourself and your family (direct ones like mother dad and siblings) should be there no matter what. For someone else besides this circle, it needs to be analysed whether they are worth it. Unconditional blind love is never good. Learned it the hard way! I have seen unconditional love unfold around me since my diagnosis. There is true love in people, and I have experienced it. You broke this down so eloquently. Thank you! And what a beautiful thing, to be able to watch and feel unconditional love shield you.